Mimics a napkin tucked in at your collar, but with a strap to keep it in place. 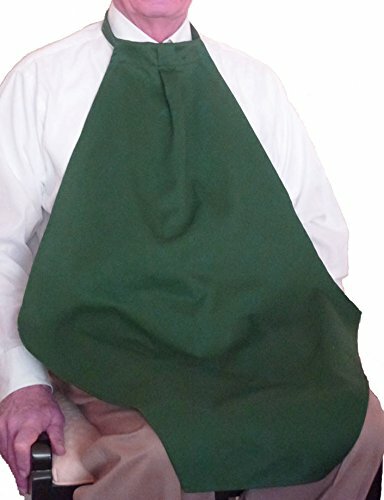 More dignified than a bib, the Napkin at Your Neck gives full coverage and is stain resistant and machine washable. Made in the U.S.A., it is 32" long x 18" wide from 65/35 Poly/Cotton twill. Developed with input from senior healthcare specialists, the Napkin at Your Neck makes life easier by keeping clothes clean at mealtime. Wash and wear your Napkin at Your Neck instead of fighting stains on your clothes. DinerWear also has other designs for more discreet protection (the Cravaat, and Cravaat II).